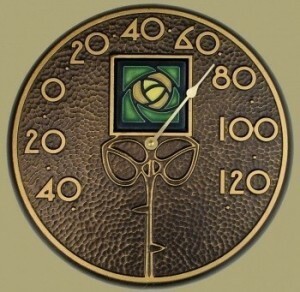 A beautiful companion to our Dard Hunter Rose Clock - this unique thermometer in cast aluminum features the number style designed by Dard Hunter, with an inset 4 " Dard Hunter Rose tile by Motawi Tileworks completing the rose and stem motif. Antique French bronze finish. The thermometer is 12" in diameter. Tiles colors: choose Green (pictured 1st), Dark Oak (pictured 2nd), or Blue (pictured 3rd).